LaBelle, Dionne Warwick, and John Prine. He says that many of these luminaries come across his work, feel an emotional connection to him, and reach out to collaborate. Rocky Schenck has lived and worked in Hollywood since he left the University of North Texas years ago, but his childhood in Texas and his family's artistic heritage informs his work. The author John Berendt (Midnight in the Garden of Good and Evil: A Savannah Story) describes Schenck’s photographs as stills “taken from a movie that exists not on film but rather in one’s memory, with all the fuzziness typical of remembered impressions.” Schenck has talked to many media outlets about how he approaches his art and how he reflects on his ties to Texas. We've compiled some of the most interesting insights into his life and process to celebrate the publication of The Recurring Dream. 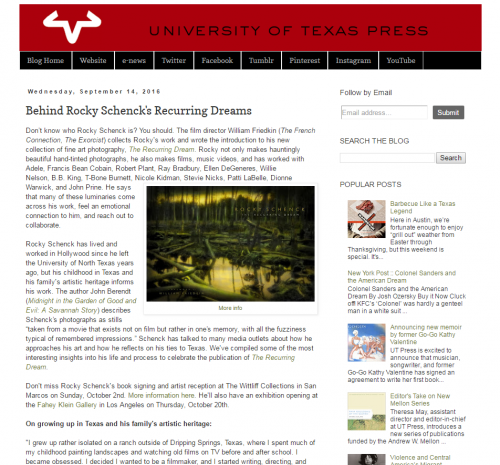 Don't miss Rocky Schenck's book signing and artist reception at The Wittliff Collections in San Marcos on Sunday, October 2nd. More information here. He'll also have an exhibition opening at the Fahey Klein Gallery in Los Angeles on Thursday, October 20th. "I grew up rather isolated on a ranch outside of Dripping Springs, Texas, where I spent much of my childhood painting landscapes and watching old films on TV before and after school. I became obsessed. I decided I wanted to be a filmmaker, and I started writing, directing, and photographing little movies. My Dad bought me a twin lens Yashica stills camera, and I learned photography while shooting stills on the sets of my little epics. My early films and photographs were all in black and white as I attempted to duplicate the look of the vintage films I saw on TV. I never had formal training as a photographer or a filmmaker. I also loved to draw when I was a child, so my parents enrolled me in an oil painting class. My ancestors were classically trained artists who moved from Europe to Texas in the 1850's, and I was a big admirer of their work. I suppose I wanted to learn how to paint in the rather romantic style of their paintings. I started selling my little landscapes around age thirteen.